Students who participate in the National School Lunch Program are more likely to come from lower-income families or families with two working parents who don&apos;t have time to pack a brown-bag lunch the night before. Those same students, as a quick glance around many school cafeterias this fall will show, are also more likely to be overweight. The challenge for researchers and policymakers has been to sort out the relationship between the two. 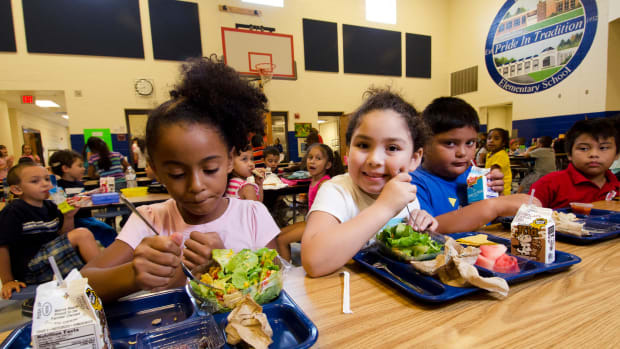 "When you just look at those groups [who participate in school lunch], those are groups also more likely to not be the healthiest kids," said Daniel Millimet, an economist at Southern Methodist University. "Then there&apos;s a question of whether or not there&apos;s actually something causal going on, or does the perception just reflect people who are self-selecting into the program?" In other words: Does the National School Lunch Program make children obese, or are obese children simply more likely to sign up for the program in the first place? This riddle is deeply relevant for policymakers trying to mine a solution to the country&apos;s obesity epidemic - an epidemic that may even have national security implications — in the school cafeteria. Millimet, alongside Georgia State economist Rusty Tchernis and Muna Husain of Kuwait University, now believe school lunches are partly to blame. "When we try to isolate causal effect," Millimet said, "it&apos;s surprising that there&apos;s still something there." In their paper "School Nutrition Programs and the Incidence of Childhood Obesity," published in the Journal of Human Resources, the authors rely on data on 13,500 students taken from the Early Childhood Longitudinal Study, which tracked children who entered kindergarten in the fall of 1998 through the eighth grade. The survey includes annual data on height and weight, which the researchers used to calculate body mass indexes (they define obesity as above the 95th percentile in BMI). The original survey also asked parents for data on the birth weight of their children, allowing the researchers to assess weight gains from birth through kindergarten, isolating the health status of children before they entered the school lunch program. The researchers also accounted for the likely meals children received from their parents at home. Millimet has a few theories to explain this. Breakfast is, as nutritionists say, the most important meal of the day. "In general, even if breakfast weren&apos;t in compliance with federal nutrition guidelines, even if they were close," Millimet said, "I think a lot of nutritionists would argue that&apos;s still a good thing." He also points to one difference between school breakfast and lunch - the latter has more a la carte options, which are not subject to the USDA nutrition guidelines because they are not reimbursable by the federal government. The a la carte tray comes with a unique set of economics. Schools are reimbursed a set amount for each meal on the cafeteria line they sell. "But then if on your way out, you pick up an extra ice cream sandwich, paying that out of pocket, the government doesn&apos;t know about it, schools don&apos;t get reimbursed," Millimet said, "and whatever profit the schools earn on that is revenue they can spend on whatever they want." Like teacher salaries or classroom supplies. Schools may be conflicted in wanting — and needing — to offer the items kids will buy. And most kids, untethered from the benevolent influence of the grownup who dishes out the lunch tray, will go for the a la carte ice cream sandwich over the plate of broccoli. The answer may not be so simple as removing the a la carte tray. "We need to think about how to make school lunches more healthy as well as profitable to schools," Millimet said. "Health is important, but it&apos;s only one issue that schools are dealing with. Before we go overboard one way or another, we have to think through the full ramifications."